The brave journeys of thousands of Welsh people who left their homeland in search of a brighter future abroad are remembered in a new exhibition. The multi-media display - entitled The Promised Land? - opened on Saturday at the National Library of Wales in Aberystwyth, and focuses on Welsh communities which sprang from as early as the 18th century in the United States, Patagonia, and Australia. 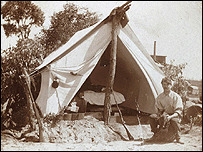 Travelling thousands of miles into the unknown must have been a daunting experience for the people who were leaving tight-knit communities where there families had lived for generations. In order to overcome the feeling of "hiraeth" (longing for home) in their strange, new countries, they would re-create their own culture and traditions - with chapels, Welsh language newspapers, and eisteddfodau as the cornerstones. Much of the literature collected from those communities from across the world are held at the National Library. "During the 19th century, thousands of Welsh people sought a better life beyond our shores," said Dr Rhidian Griffiths, the library's director of public services. "Their literature and memories add an extra dimension to the Welsh experience and deserve to be recognised." 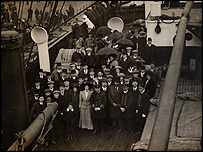 The exhibition includes a cross-section of memorabilia, film and documents about the momentous change which emigration brought to people's lives. Some of the key exhibits include a copy of Cân Newydd i America (New Song for America), a ballad printed in Carmarthen in 1797,and a copy of Yr Awstralydd (The Australian), the 19th century newspaper founded for Welsh settlers in Australia. There are also momentoes from Helen Wareing of Aberystwyth, whose father was an engineer in the city of Hughesovka - or Donetsk - in the Ukraine. The Welsh colony in Patagonia, Argentina, is prominently represented. The diary of Michael D. Jones (1822 - 1898) who was the inspiration behind the great venture to form a homeland where Welsh would be the official language, free of the Anglican church, forms part of the display. 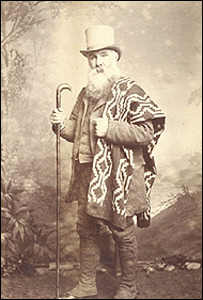 Other exhibits related to Patagonia include the boarding ticket of the Reverend Abraham Matthews of Aberdare for The Mimosa, the ship which sailed out of Liverpool in 1865 with the first pioneers, and the original diary of the Mimosa crossing by Joseph Seth Jones, a print-worker from Denbigh. There are shots of children riding home on horseback from their Welsh-language school in Cwm Hyfryd, Patagonia as well as more recent images Welsh tea houses, which remain popular there.